One of the things I love the most about being able to sew, is being able to make just about whatever I want. 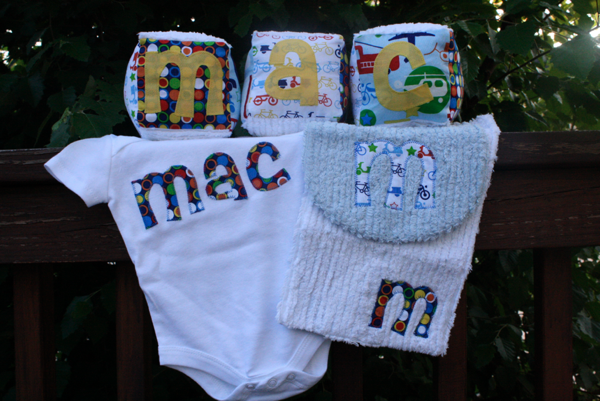 One of my favorite things to create is unique and personalized baby gifts. Last year I made this one for a friend to give to a friend of hers. The blocks were a huge hit! 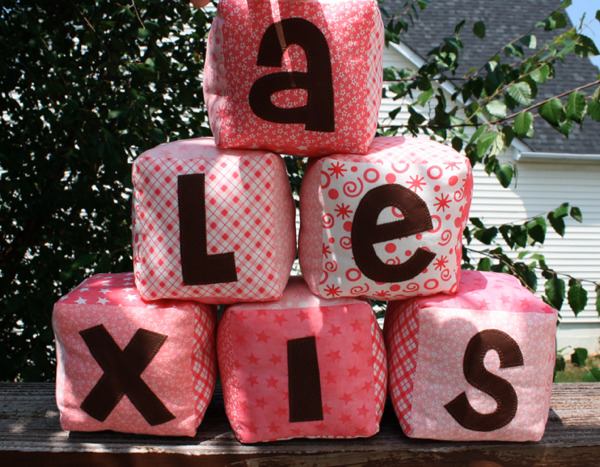 So this year, I got another request for baby blocks—this time for a baby girl. 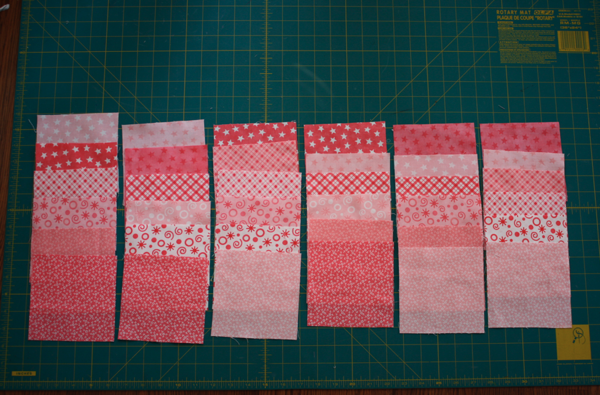 I got to choose the fabric for these, and I really love all the pinks together. 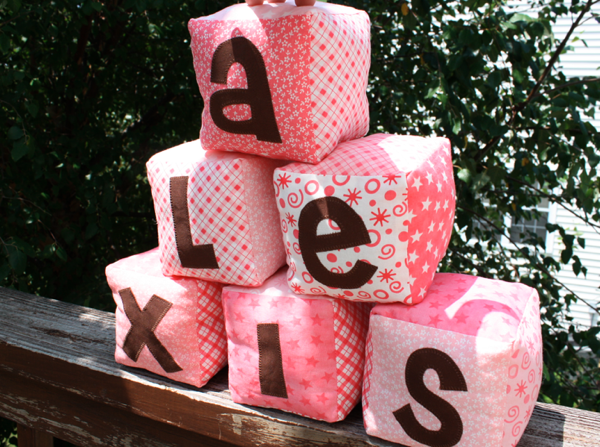 As I made them, I took pictures so I could share the very easy process of making these adorable little blocks! To start, choose your fabrics. I’ve had these forever and love them so much! 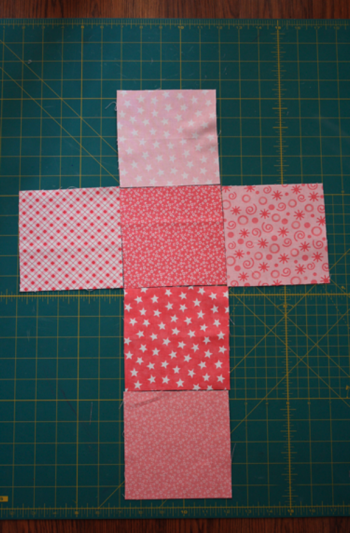 Cut 6 for each block you’re making and arrange them in an order you like. I didn’t want to have any 2 blocks exactly the same. Then lay them out. I don’t want any of the same pattern to be next to each other so I like to get them all in order before I begin sewing. 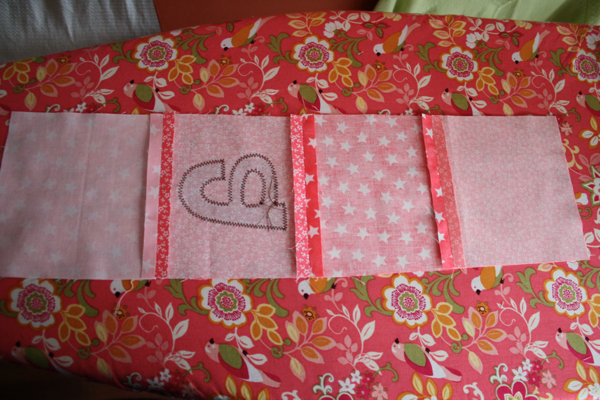 Then to mix up the way they’re arranged, I lay out my applique letters and make sure I like the order they’re in. Whew! That’s a lot of planning! But it really helps to be on top of it like that to avoid mistakes later. Then I applique my letters to each designated square. And I’m ready to start assembling! I lay them on the floor next to my machine in the “right” order. 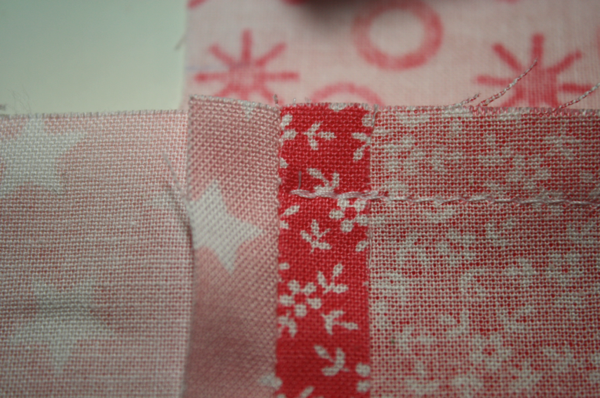 To begin, I sew the middle 4 squares together using 3/8″ seam allowance, then press my seams open. 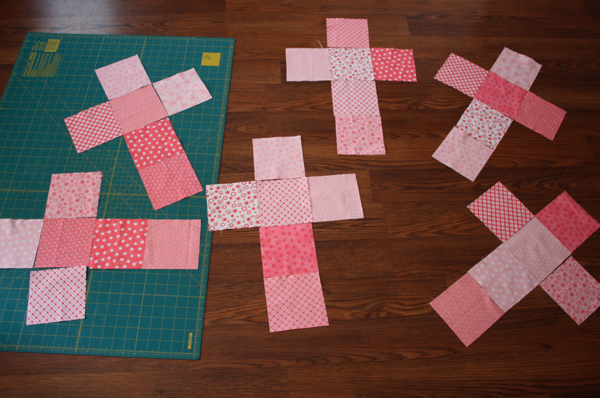 Then attach the blocks on either side of the appliqued one. When you attach them, only sew them to the one square, not end to end. Then you’re going to start attaching your sides. I always do mine in the same order, but it’s totally a personal preference. 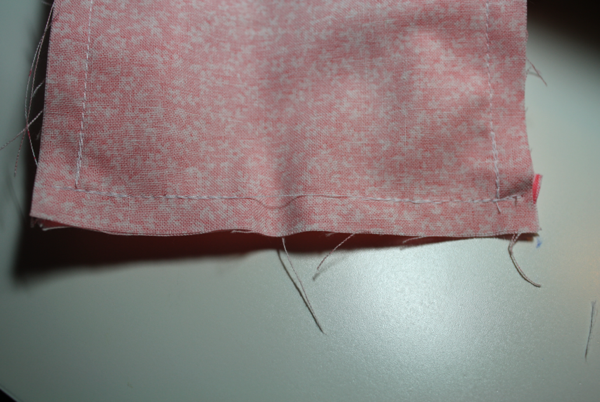 To sew the sides together, just match them up along the straight edge and sew with right sides together. 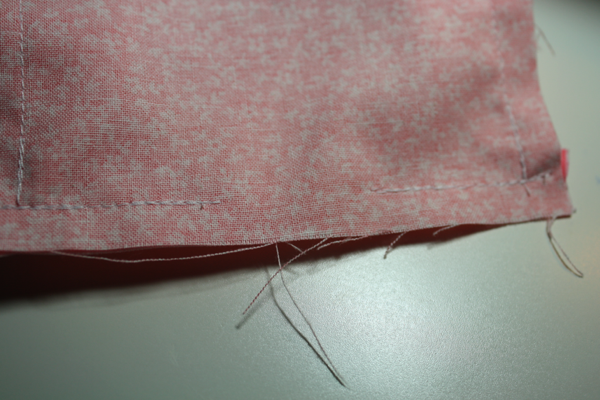 Remember we’re using a 3/8″ seam allowance so you’ll want to start and stop 3/8″ from each edge. Then attach the next 2 sides. And continue around the block. When you get to the last side, you’ll need to leave a hole to turn the block through and stuff. I start at the edge, sew about 1/3 of the way across and backstitch, then lift my presser foot and move about 2″, then sew and backstitch and continue to the other side. Then I simply clip the threads and have an easy opening! 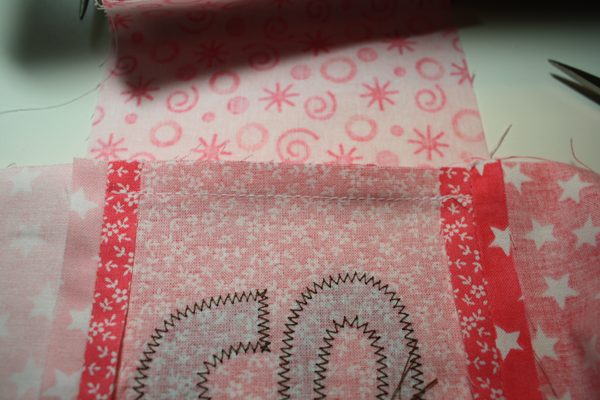 Turn the block through the hole, poke the corners out with a chop stick or pencil, and stuff! Whipstitch the holes closed and you’re done! 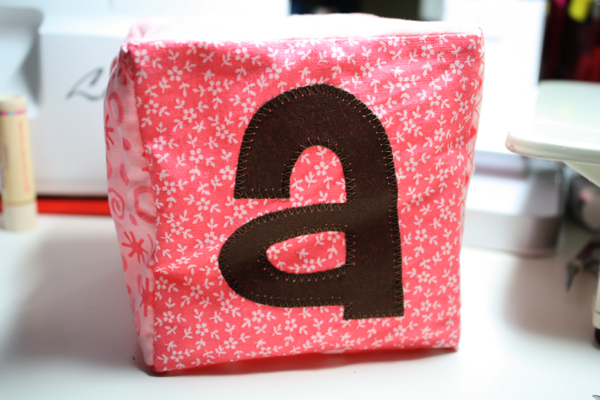 Easy as pie baby gift! Thanks for this tutorial! My sister-in-law is expecting and I must make this as soon as they baby is born 🙂 It’s really a great gift! really cute! what font style is that? I really like it! 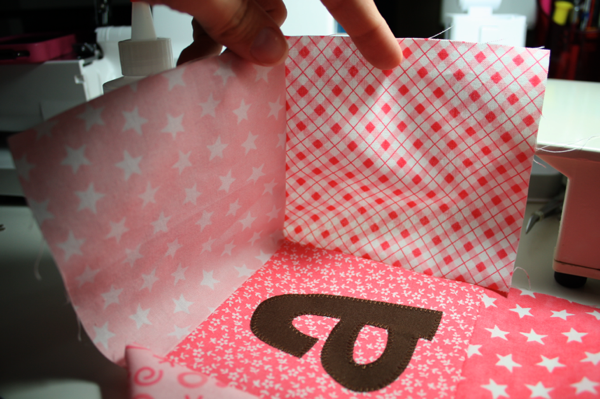 I am making blocks for a friend’s baby (but with no name as the baby has no name yet, and in unisex colours too!) and I wanted to tell you I am sewing in some eggs from a Kinder Surprise (the little yellow plastic eggs that sit inside). One has dry rice in and one a single, large, plastic bead. Another has a couple of kidney beans. This makes them all make different rattling noises which I hope will engage the baby. 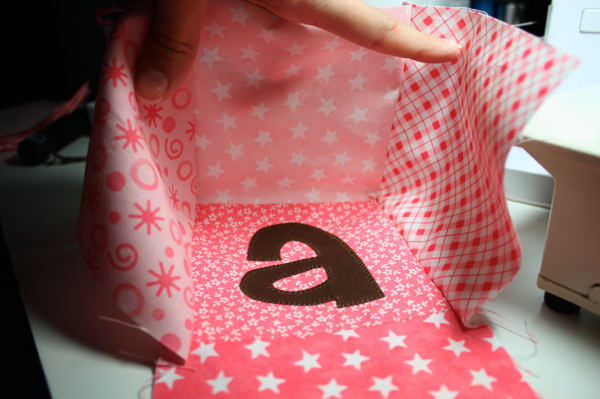 I’m also sewing some plastic from an old bag into a fourth block so that it will crinkle. I love this! And I love the tip from Elise about ways to make them rattle too! But I have a question…How do you cut several squares and get them to all come out the same? So many times I have cut squares for projects or blankets, and then when I go to start sewing them together, things don’t line up right 🙁 any advice would be great! I am self-taught, and have only been sewing for a few months. Thanks! Thank you! Unfortunately we can’t get Kinder Eggs here in the States (and oh how I miss them! ), but you can do the same idea with small plastic easter eggs. 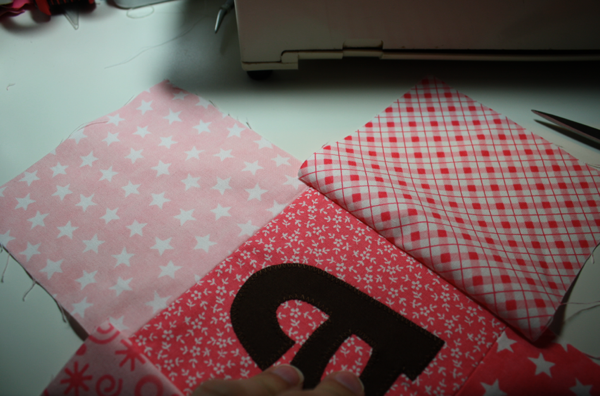 As for cutting my squares, I use a rotary cutter and mat with a large plastic ruler to cut mine. It makes them perfect squares each and every time! If you want to get a self-healing mat and rotary cutter, make sure you get them from a store like JoAnn’s or Hancock where you can use a coupon to save a bundle because those puppies are pricey (but worth it!). Sorry, I totally didn’t realise you wouldn’t be able to get Kinder Eggs! I did live there for 3 years when I was younger, but there was so much to see and so many wonderful things to eat and try I never missed them! I am about to embark on making my husband a fabric painting for our 5-year anniversary (I’m going to represent the lyric “We have all the time in the world for love” in fabric on a canvas) and I plan to use your appliqué tutorial to make it gorgeous. I have sewn my entire life but never used a sewing machine until a month or so ago (I’m 29!) and having such comprehensive tutorials online REALLY makes a difference. I’m in the middle of making the second set of these. Everyone loves them! I have found it slightly easier to get the squares to match up in the final stages lined up by stitching the top edge of the top square (when the cross shape is laid out flat) to the bottom edge of the bottom square to create a ‘hollow’ cube. I found it easier to then line up the ‘lid’ and ‘base’. Can’t wait to finish this set and give them to my friends and their new arrival! Thanks for the great blogs! How are the letters done? Did you use a machine or just a template? I don’t have a machine so how could I cut/get nice letters? I have several family members having babies this summer so plan to make these to save some money on gifts! Thank you so much for posting this tutorial! I just finished my first set of blocks for my new baby niece and I love them! Can’t wait to make more. Just one thing I added because of a suggestion from a friend who had made them as well-I put bells, rattles, and plastic bags in along with the stuffing to make the blocks a little more appealing to little hands. Now they jingle, rattle, and crinkle. I got a multipack of cat toys at the dollar store for the jingles and rattles. They were the perfect size to put into the blocks. Thank you so much for posting this amazing tutorial! I just became an aunt and my little niece is going to love these when she gets a bit bigger. For now, they are going to look so cute displayed on a shelf in her room. 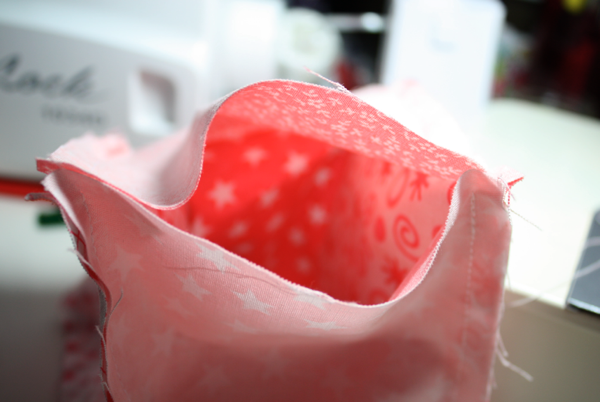 Thanks again, I really love your blog and have so much fun trying all your sewing ideas. Thank you so much for this! My friend is having a baby girl this summer and I knocked these out yesterday for her! 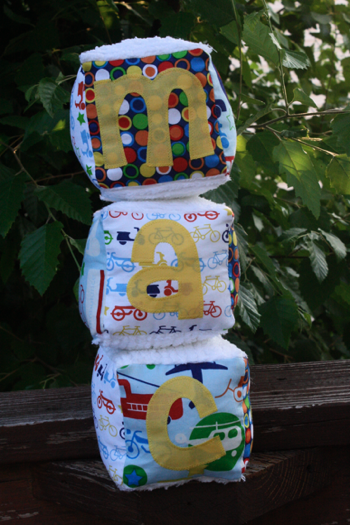 I love how the blocks turned out so i’m going to try a bib and the bean bag taggie to go with! This is perfect! 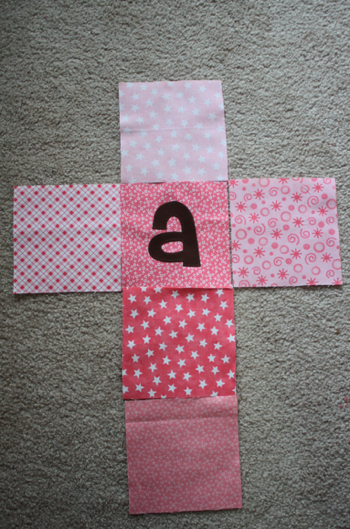 I’m planning a baby shower and wanted to decorate the panels for blocks instead of onsies, but needed an easy how-to to be able to put them together. Thanks!! 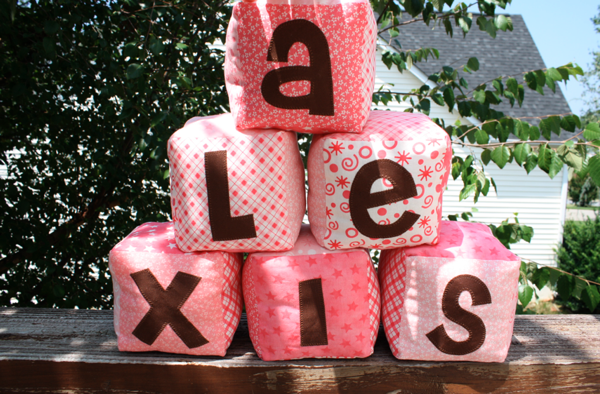 I use my embroidery machine instead of applique to add letters to the blocks. 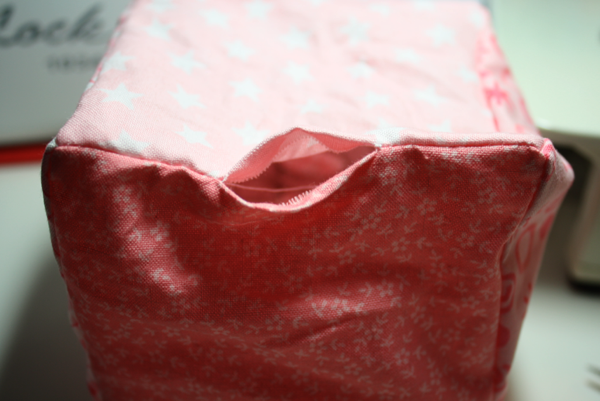 Then I can sew cute things on the other sides to keep it interesting for the baby. Great gift for baby. I have plenty of unused material and will be making these gifts and getting them out the way. Also, I am going to sell some at a handmade crafting show next month. I would appreciate if you didn’t sell them. There’s a disclaimer on my sidebar that asks you only use my tutorials for personal use. Obviously I won’t know if you really do or not, but I’m hoping you choose not to. I think this is such a fun idea! I was wondering how you made the letters as well. Also I was wandering how much fabric I would need to buy if I am making 4 blocks, 6 different fabrics? Thanks for the help! 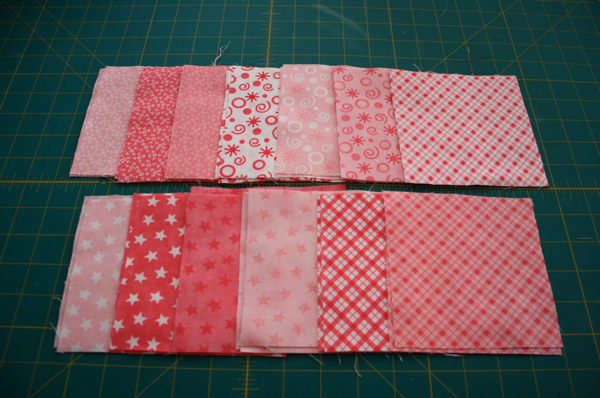 To make 4 blocks with 6 fabrics, you would need 5″ of each fabric, by the width of the fabric (45″). If you’re buying fabric, I’d buy an extra inch or two since fabric is generally not cut very straight. 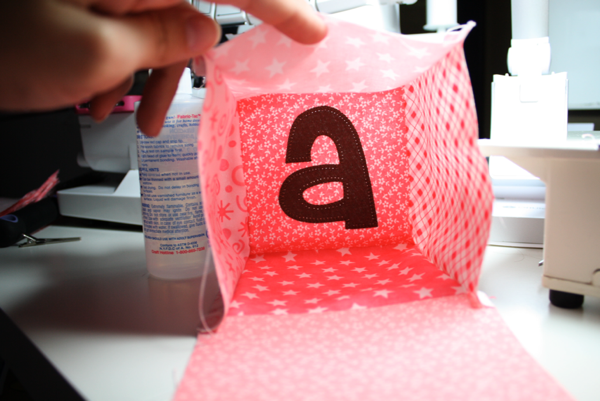 Then you’ll need a little extra, depending on what you’re using for your letters. To make the letters, I use MS Word on my computer and blow the letters up large, flip them backwards, then trace them directly from my computer screen. 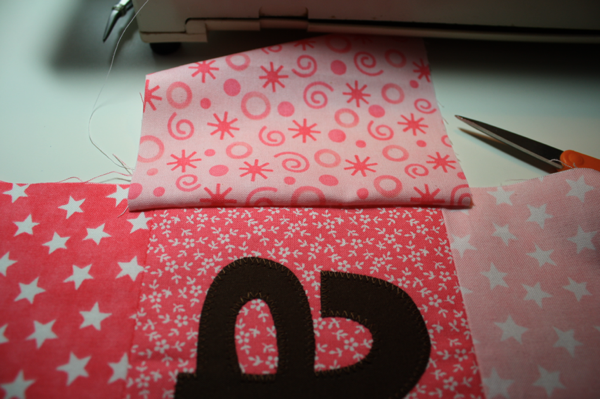 If you go up to my Tutorials tab and look for the applique tutorial I show how to do it. Hope that helps! I may have missed it, but do you stuff these blocks? And, if you do, what do you stuff them with. They are so cute. I like to make baby sets (bibs, burp cloths & binkie straps) for baby showers at our church, and I’d love to add a couple of baby blocks. Thanks for the info. Yes, the very last thing I do is stuff them with regular batting, like the bags of polyfil. I love this idea. I have some charm packs that would work great for this. Already cut and waiting to be used. 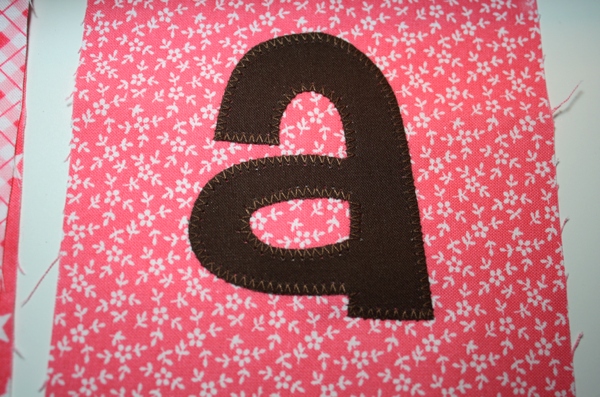 Where do you find the letters for the applique? I am attending a baby shower on Saturday. This would be a great extra gift to give. thanks so much! I just love this idea. I was wondering how I can find a download for the letters. please help. Thank you! Thank you for this tutorial. I just made this for a special little baby named Lisa. I love these. I think I’m going to make them for my month to month photos as the baby grows. Thank you for posting this.